Nomination of candidates for the July 30 poll started at 10 am. The Nomination Court for the Presidential election is sitting at the High Courts across the country. The Nomination Court for the elections for the 210 constituency seats in the National Assembly constituency elections and the local authority council elections is sitting at lower magistrates courts. ZEC chairperson Justice Chigumba speaks to the media after the closing of the nomination process at the High Court . The Nomination court has closed in Midlands. Zanu PF Midlands Provincial Spokesperson Cornelius Mpereri said all 40 Zanu PF aspiring candidates had submitted their papers. MDC Alliance Gweru Urban candidate Advocate Brian Dube said his party was happy with the proceedings. We're pleased to announce my official approval as a Presidential candidate in the upcoming elections with @ZECzim. We have 11 Presidential candidates so far. So I hear @DrThoko_Khupe nomination papers are being filed by Priscilla Misihairambwi of MDC Welshman. She is wearing a hoodie with “Hure” at the back and “Me too” at the front. Agrippa Mutambara, of the ZimPF and a member of the MDC Alliance, said they filed nominations for three seats, Rushinga, Shamva North and Bindura. Mutrambara will contest to represent Bindura North in parliament, under the MDC Alliance banner. At 1230 p.m, MDC T had not located some of their Lupane East and Lupane West council candidates amid fears they might have chickened out. The missing candidates for MDC T are for Gomoza, Lupupu, Lupaka, Lusulu, Ndimimbili among others. At the opening of the nomination court, Zec had received about 100 papers from the prospective contestants. Gift Chimanikire of the MDC Alliance said he has switched to Mazowe South constituency in Mashonaland Central province after he lost the bid to represent Southerton in Harare during the MDC-T primary elections. "I will give the Zanu PF candidate, Fortune Chasi a run for his money. The leadership directed me to come to this province," he said. Noah Mangondo, who lost in the Zanu PF primary elections, has has filed his papers as independent candidate for for Murewa South, and he will be battling against Joel Biggie Matiza of Zanu PF. ZAPU and Khupe's MDC-T have a number of candidates who have submitted their applications and there are also some little-known parties that are filing. Those that successfully filing their papers are being told come back for the final process before 4 pm. Job Sikhala's nomination papers are not in order and he is being constantly called by the presiding judge to bring proper pictures. He is aspiring to represent Zengeza West under the MDC Alliance banner. Aspiring MP for Harare South Tongai Mnangagwa also submitted his CV yesterday and told the Daily News afterwards that he can now focus on campaigning for the ruling party led by his uncle after enduring weeks parrying attacks from losing candidates who include war veterans leader Douglas Mahiya. "I have finally submitted my nomination papers and I feel its a relief, It was not an easy thing to do but God was in it and so we have won. To those who have lost I would like to invite them to come and work for the party. I need...Mahiya in my team so that we will win the seat." Asked if the name Mnangagwa did not work in his favour Tongai said it was actually used against him. For an MP the nomination fee is $100 and the amount could not deter even those from so-called smaller parties like Build Zimbabwe which also had several aspiring legislators submitting their CVs. Outside the car park at the magistrates court was packed with an assortment of cars, from ramshackle vehicle to latest models as everyone with a dream came to try his luck. Most of the aspiring legislators arrived in with bodyguards with controversial minister of Finance Terrence Mukupe arriving with at least eight aides at the nomination court. But his was not an isolated case as most of the aspiring legislators also brought with them their supporters. Zanu PF losing candidate for Mbare constituency Emmanuel Mahachi also filed his nomination papers in Harare queuing a few metres from Zanu PF elected parliamentary candidate Tendai Savanhu. Savanhu refused to talk to journalists when he walked into the Rotten Row Court House with one of his aides almost manhandling a photographer. MDC Alliance senatorial candidate Giles Mutsekwa has confirmed that they are wary of possible double candidates and are closely monitoring candidate arrivals at the nomination court. There are fears that where MDC Alliance partners second perceived weak candidates MDC-T would sneak in its own candidate. Meanwhile at Mutare Magistrates's court MDC Women's Assembly leader Lynette Karenyi has been reassigned to the proportional representation slot after Dangamvura-Chikanga constituency was handed to Prosper Mutseyami. MDC has given Makoni Central to David Tekeshe after the primaries had been indeterminate. He was being contested by Patrick Sagandira and the primaries had been twice disrupted. 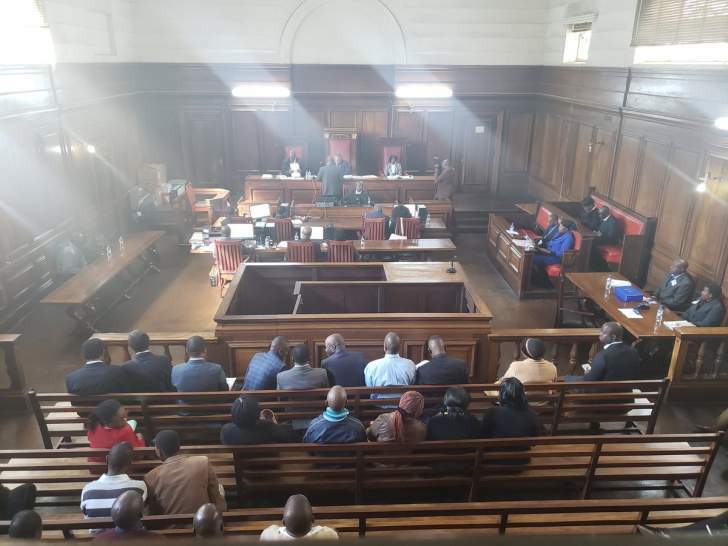 Prospective House of Assembly and Senate candidates drawn from various political parties swamped the Zimbabwe Electoral Commission (ZEC) Bulawayo provincial nomination court housed at Tredgold Magistrates Court to submit their nomination papers ahead of for the July 30 polls. Nomination court proceedings kicked off at 9am. ZEC provincial elections officer Innocent Ncube began by announcing names of potential candidates who had made submissions before today's the court's sitting. ZEC has also made available several electronic payment methods for candidate to pay for their applications with Ncube adding that some were still to settle the costs. He said they had received standard submissions as well as those that did not meet the requirements, and were still open to accepting more submissions throughout the day. Candidates however complained about the snail pace at which proceedings were progressing. The nomination court has been packed since morning with most candidates waiting in the corridors. Meanwhile, it was also a hive of activity at the Bulawayo City Council chambers where local government nomination court is sitting. Across town Matabeleland North provincial nomination court is sitting at Western Commonage magistrate courts. Here ZEC started by announcing names of those who submitted during the pre-nomination process before taking new nominations. The candidates are however impressed with the way the proceedings are going though the court is packed with some candidates waiting outside. Unlike at Tredgold magistrate courts here the process if fast. Meanwhile, there has been complaints coming from some MDC Alliance partners particularly the Welshman Ncube led MDC and the Tendai Biti led PDP who felt short-changed by the mainstream MDC who they accused of allegedly departing from the partnership agreement by fielding candidates in all the local government constituencies in the city. Daily News witnessed last ditch engagements between MDC Alliance spokesperson Welshman Ncube and MDC provincial chair Gift Banda over the matter. This left the Alliance in a quandary with double nominations for some wards most likely to be the order of the day. MDC Alliance Elections Agent Officer, Jameson Timba speaking to journalists after filing nomination papers for @nelsonchamisa . Priscilla Misihairabwi-Mushonga, chief election agent for Thokozani Khupe, appeared at the Nomination Court in a hooded sweater inscribed "Hure" at the back. It seemed to be a protest at the recent display of sexist abuse by MDC-T members loyal to Nelson Chamisa who chanted "Hure,Hure" in an apparent reference to Khupe when she appeared in court recently over the dispute involving the party name and symbols. Opposition New Patriotic Front (NPF) leader Tendai Munyanduri has also lodged his papers as presidential candidate at the Harare High Court. There was a heavy presence of police at the smaller courts where suspected state security agents also maintained a presence apparently to monitor the situation and also those who would want to spoil the broth for Zanu PF which is anxious to exorcise the demons of the 2008 scenario now famously known as the bhora musango era. Outgoing Epworth MP Zaleria Makawa also submitted her CV as an independent ignoring President Emmerson Mnangagwa impassionate pleas for losers to graciously accept the results of the Zanu PF sham primary elections. Aspiring independent candidate for Mt Pleasant Fadzai Mahere and former MDC MP Jessie Majome both submitted their CVs as independent candidates along with a host of aggrieved persons who felt they were elbowed from the gravy train of either Zanu PF or the MDC. The former Zanu PF and former MDC activists is now hoping for supper on breakaway MDC formation leader Thokozani Khupe platter. Political flip flopper Gabriel Chaibva also threw in his CVs. Chaotic scenes at the Rotten Row nomination court as scores of aspiring candidates drop their CVs. Police were out in full force to bring to order the picketing aspiring candidates. Daniel Chingoma leader of the Zimbabwe Industrial and Technological Revolutionary Party (ZITR) says he has been asked to get new photos as the ones he brought were not approved by the Nomination Court because he was wearing a cap. MDC Alliance senatorial candidate Patrick Chitaka and Zanu PF Buhera South candidate Joseph Chinotimba have filed their papers at the nomination court there. Nelson Chamisa used the MDC Alliance name. Thokozani Khupe has just filed her papers at the Harare High Court under the MDC-T name.